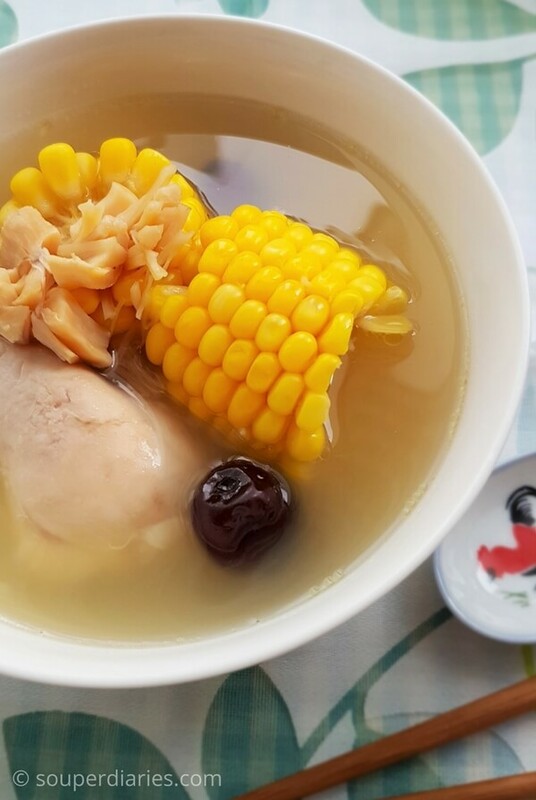 Naturally sweet and tasty, this Chinese sweet corn soup with dried scallops helps to improve the appetite, strengthen the kidneys and balance the digestive system. I love corn however they’re cooked – grilled, boiled, roasted, steamed, baked, fried, you name it.. they all taste delicious. Maybe it’s the happy yellow colour (yellow is one of my favourite colours) or the juicy sweetness when I chomp on the corns. There are only four ingredients for this soup. Sweet corn, chicken, dried scallops and dried red dates. Use fresh sweet corn on the cob and not the frozen or canned type for this recipe. You may also add fresh Chinese yam if you wish. 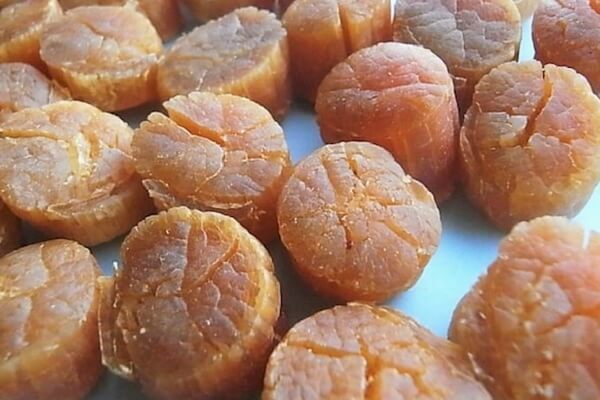 Dried scallops are considered a delicacy and expensive but they add an umami flavor to any soup that you add them in. I usually save them for certain soups such as this. An added benefit is you’ll only have to use minimal salt (if at all) if you have dried scallops in the soup. In Traditional Chinese medicine, they are believed to strengthen the kidneys, balance urination and help the body to recover from long-term illnesses. Read more about it here. If you have any leftovers of this soup, don’t toss it away! It is so sweet you can use it as a stock. Refrigerate and use the soup in your stir-fry vegetables in place of water. How to choose the best sweet corn? In Singapore, an ear of bi-colored corn costs almost triple the price of a yellow corn. However, sometimes in the yellow corn section, I do come across corn with some white kernels but it’s not often you’ll see them. If you can find corn with yellow and white kernels, go for it. Cook the sweet corn as soon as possible after you buy them. The longer it’s kept, the less sweet it will be. Pick those with plump and shiny kernels without any dimples. If it looks wrinkled, it’s an indication that the corn is old and won’t be as juicy and sweet. More information on choosing an ear of corn can be found here. 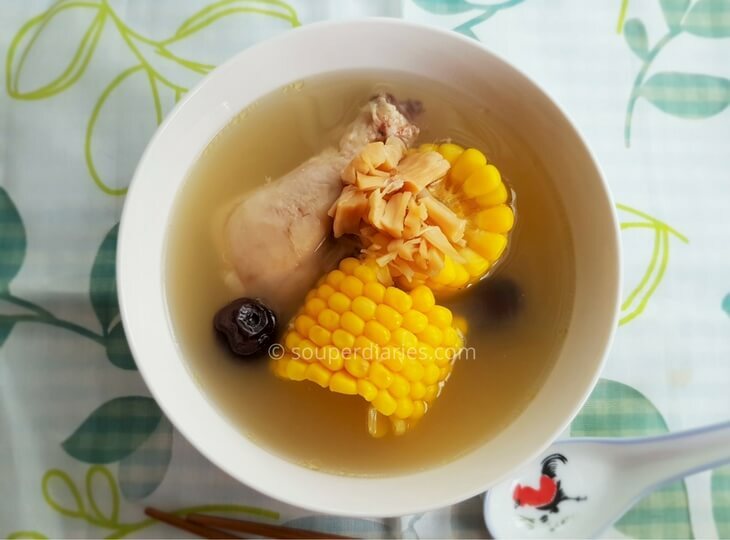 If you love sweet corn, try my other Chinese Sweet Corn Soup recipe too. This delicious and naturally sweet soup helps to improve appetite and strengthen the kidneys. Blanch chicken in a pot of boiling water. Remove, rinse with cold water and set aside. Place all ingredients in a soup pot including the soaking water for the dried scallops and bring to a boil. Then simmer over low heat for 2 hours. Season with salt to taste. Sorry for the late reply. Yes, you can but the taste will be slightly different. Thanks for the instructions Yvonne! My mum is a passionate cook so I will print out the recipe for her! this looks like another delicious soup I would like to try! I love these 4 simple ingredients to make a tasty soup. Is the 2 hours optimum for the flavors to come out? How can I help the process to make it as flavorful but in less time? 2 hours is the optimum time if you’re boiling this with a regular soup pot on a stove top. 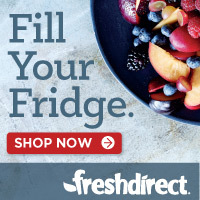 If you want to cook this in a shorter time, you can consider using a pressure cooker which can cut down the cooking time to a third to half of the time. Read more about the different types of soup pots here. I’m not much of a soup lover but this one really looks good. I’m going to try this for dinner tomorrow. I also love corn but I was surprised to hear how expensive it is for bi-coloured corn compared to yellow corn! I know Singapore is expensive because I lived there for a year (I’m in Malaysia). Anyway maybe it’s the same here, I’ve only seen the yellow corn. Great recipe though, looks superb! that’s a great idea I’ll try your recipe next week. Reading made me already hungry. Does that need really two hours? Seems a long time to me, but I have to admit I’m not a great cook. 1. What is a “fuzzy logic rice cooker” – I have heard of rice cookers, but never heard of a “fuzzy logic” type. 2. Any ideas where one could find corn with yellow and white kernels? Thank you for your time. Have an awesome day. I am looking forward to more recipes to try out. Hi Steph, thanks for writing in. Fuzzy logic rice cookers have microchip technology that enables them to cook a wider range of food compared to an electric rice cooker. You can find corn with yellow and white kernels at a farmer’s market but “regular” corn works fine for this recipe too. Hey there Yvonne, I like this recipe, it looks very appetising in the picture. I am not a fan of pork but I guess I could replace it with an alternative. Hi Ellie, you can replace the pork with chicken. Sometimes I make this with chicken too.